What do you want from your e-procurement system? At Procurehere we’re constantly asking this question, and we’re constantly receiving the same answers: I want to save time, and reduce costs. You know what we decided to do? Deliver a market-leading simplified e-procurement system that saves you time and money. It made sense when you think about it. The challenges of cost efficiencies are a huge driver of a successful procurement function. But saving time is equally important. That battle against lost time is vital when you realise just how much of it we lose. Studies show we’re distracted on average every 185 seconds at work. It can take up to 23 minutes to regain focus. Employees of large companies spend 40% of their working time on meetings, administrative tasks or interruptions. The average commuter in KL spends 158 hours per year in traffic. That’s 158 hours of wasted time adding no value to your work. When you add up these numbers, it’s clear why e-procurement time savings are such a crucial part of the Procurehere offer. From collaborative evaluation and paperless tender processes to purchase requisition approvals in under 8 hours, we’re working to help you win the war against lost time in every level of the e-procurement process. So how does all this work in the battle to save costs? You’d be right in thinking time is money. But Procurehere goes a lot further than just time savings, it offers direct and measurable cost-savings for your procurement activities. Our cloud-based Version 7.0 platform links up sellers and buyers from throughout Malaysia and the wider region. This unlocks a huge opportunity for e-sourcing and requisitioning that can deliver significant financial savings for our customers. 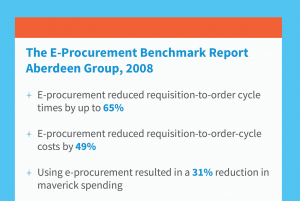 Don’t just take our word for it, here are some key findings from a seminal 2008 study on e-procurement. Procurehere have created our own ROI calculator to help our customers explore the potential of e-procurement savings for your business. Procurehere users have realised average savings of 17% per auction event to date, with more than US$1.2 billion spend undertaken on our platform since 2002. That’s a significant return for any business. We know it sometimes seems like work can be an endless battle to save time and money. That’s why we’ve built a platform that directly answers those challenges you face every day. So next time we ask that question, what do you want from your e-procurement system? We’ve got the answer in Procurehere.